Lilly was born asleep and in poor health in October 2006. She spent a few weeks in hospital after tests failed to diagnose the cause of her problems. We came home to enjoy our princess. We knew she had problems as she failed to meet all her milestones and had other health issues. Finally, after much scouring of the Internet and many tests, in September 2008 she was diagnosed with Koolen Syndrome (17q21-31 microdeletion syndrome), which is a very rare condition only affecting a handful of people in the UK. Due to this condition, Lilly suffers with severe hypotonia, hypermobility, visual impairment, severe global developmental delay, low immune system, epilepsy, asthma and other respiratory problems, is hypersensitive to sound, has neurological problems including pul brain damage, scarring to her brain and a type of autism called sensory processing disorder. As the condition is so rare not a lot is known about it and we have more questions than answer,s but at least we now know. Lilly really is the bravest, happiest girl ever, and I’m so proud of her. She has to attend 3-6 hospital appointments a week and is constantly having to endure tests, procedures and hospital stays but never moans and still smiles. Since our last update Lilly’s health has being pretty good for once, though her eyes have deteriorated even more which is very upsetting for us but is really upsetting her as she doesn’t understand why. She also has a few other health issues that are being investigated at present but she’s plodding on bravely as always. Thank you very much to all who sent Lilly lovely Christmas cards, letters and gifts. She especially loved her package from her elf Catherine and the Minnie Mouse toy (so sorry, can’t remember who sent it) and the wonderful Christmas balloon which was delivered to the ward. It was a hectic time for us as she was in Great Ormond Street hospital Christmas week and only got home on Christmas Eve. We then visited family in Yorkshire. The main news for Lilly is we’ve discovered from the tests in GOSH that she’s having far more epileptic seizures than we thought, so she now needs an MRI to see if she’s a candidate for brain surgery. This is a scary thought for us all. Yesterday, at her eye appointment, we discovered her eyes have deteriorated even more, she already is severely sight impaired/blind so that’s also scary, but as those of you who follow Lilly on her Facebook page will know she’s still as happy and brave as ever and so funny. Hi all, Lilly wants to say a big thank you for her special sweetie hamper and all her mail recently. Sorry for not thanking sooner. Once we get a free minute we’ll use the popcorn, probably nearer to Christmas. Lilly’s seizures haven’t been so good lately, so on 21st December she’s going into Great Ormond Street on Koala Ward for 2 or 3 nights for continuous EEG and tests to try and help ease her epilepsy. We’re dreading it, especially as it’s Christmas week, but if it gets us some answers then it’ll be a good thing. Lilly’s vision is still deteriorating, but she’s been as brave as ever. She’s loving baking recently and still loves her babies. For Christmas she’s asked for the rosebud dolls house from Early Learning Centre, so she’s excited to be getting a dolls house. She also loves dressing up, but getting things aged 9 and up is tough, but she still has fun. She still loves music and musicals and is obsessed by London, so next year we’re saving to give her a treat of a weekend there seeing a show, sights etc. Anyway, thank you so much to all who’ve supported her this year. It means so much and really does cheer her up when she’s down and not well! Thank you! Lilly’s calmer and happier now she is back at school as she didn’t like the break in routine of the school holidays. Her eyesight is continuing to deteriorate but, as always, Lilly’s coping so well. We’re having to go to Great Ormond Street for more tests as Lilly’s epilepsy isn’t responding as well to her medication any more, but we will get through this. 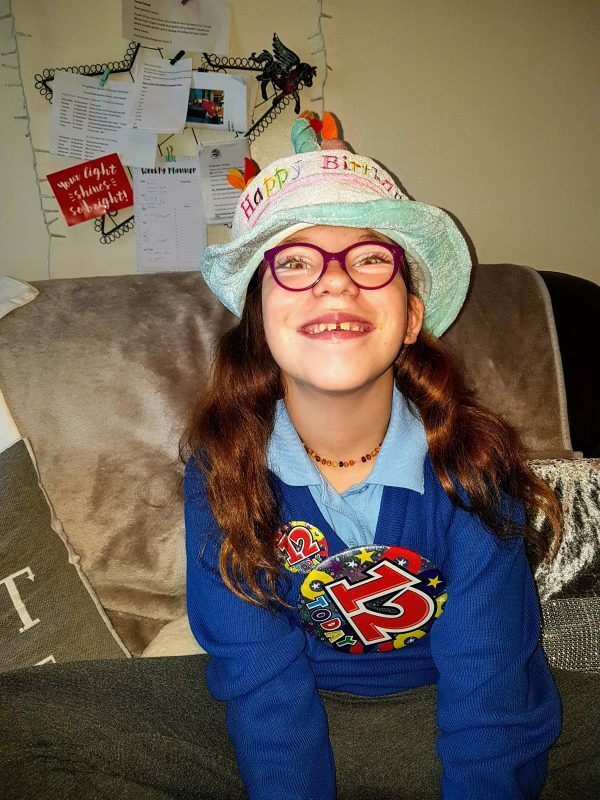 Lilly’s getting excited this month as she turns 9 and this is a massive thing to us, considering the bleak start she had in life and the bleak prognosis we were given. Thank you everyone who supports Lilly at Post Pals and for her monthly post from Kathryn and the support she gets from Jess and Crystal and Amber. Lilly is very grateful for her recent post, especially her themed monthly parcels. She also wants to thank all the Brownies who send her post as she loves them because she’s a Brownie too. Thank you to Bev for the tiara and she is grateful to Crystal and Amber too, for always spoiling her. To everyone who sends her little gifts and cards, they really do cheer her up and bring a smile to her face, so thank you very much. At present Lilly is dealing with slowly losing her vision and she’s is now diagnosed as severely sight impaired/blind, which is confusing and heartbreaking to both her and us. She’s also having difficulties with her mobility and we don’t know if it’s connected to her vision or her syndrome. She’s had lots of falls lately and she’s also had a few violent seizures (due to her epilepsy) which have caused her injuries. Thank you so much to Post Pals for Lilly’s lovely balloon you sent her. Thank you to ‘naughty nanna’ for Lilly’s awesome advent calendar, and also to Crystal and Amber for spoiling Lilly all the time, she loves your post. Thanks also to Bev for all the post and gifts you send Lilly, and also to Rissy for being so thoughtful. Thanks to Kathryn for Lilly’s lovely monthly projects and to the anonymous people who have sent her lovely surprise gifts of build a bear goodies and brownie goodies. A big thank you soooo much to all the brownie groups that have sent her wonderful gifts and also brownie gifts, as she’s a keen brownie and she really loves these. She especially loved badges sent to her so we’ve sowed them onto her brownies blanket. Thank you to all as your kindness really does make her smile and humbles us too. 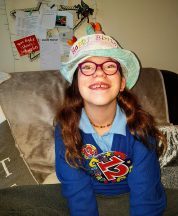 Recently we’ve been told Lilly’s eye sight has deteriorated so much that she is now officially partially sighted and is being placed on the partially sighted/blind persons register. This has broken our hearts and shook us up, so all the lovely mail has really cheered her up. Other than that she’s plodding on. She’s had a few more seizures recently but we’re all plodding on. Sorry I haven’t updated you for a while but on top of all Lilly’s health needs I’m currently having my own health issues, so it’s been a stressful and hectic time. Thank you very much for all the fantastic birthday cards Lilly had sent in October, we were blown away by how many she got. Thank you also for the balloons someone sent her and the lovely book. Thank you to Laura and Claire for Ryan’s birthday cards in November too. Over the last few months Lilly’s had lots of lovely cards and postcards sent to her and her fave ‘Dottie mail’ which she has loved, so thank you everyone for those. Finally, thank you very much to naughty nanna for Lilly’s awesome advent calendar, she can’t wait to start it. As always, thanks for your constant support to Lilly and us as a family. Thank you soooooo much to the 14th Hornchurch brownies, Hornchurch, Essex, for Lilly’s amazing surprise of a beautiful build a bear and lots of amazing cards by your lovely brownies and her brownie badge. She is besotted with her new bear, she’s named ‘brownie’ and she thinks it’s amazing some brownies did this for her as she’s recently joined brownies. Thank you very much for making her so happy, she’s going to make a card for the brownies. Hi everyone, thanks so much for all the lovely bright and colourful postcards and cards Lilly has received this last month. She has also received a few colouring books and a bracelet – the post always cheers her up. Lilly’s still recovering from meningitis in April but is getting stronger all the time. We had a massive set back last week though when she had a different and bad kind of seizure which shuck us all up and wiped her out. Thank you so much for the gift I got (a hug in a mug and bear) and Lilly’s treats too as they cheered us up lots. It also made me so emotional as I’m not used to being treated too and such a thoughtful gesture! Thank you all so much for always caring and thinking of us on this journey. Ryan is doing really well, he’s just done his silver DOE expedition and is half way through his NCS program. It’s amazing and lovely as he’s getting to have some rare and much needed fun and break from being a young carer for myself and his sister. Lilly was very ill in hospital with meningitis and hasn’t been 100% since. She’s finally starting to be more herself and is getting stronger every day. She had a few balloons and some lovely cards and postcards while she was in hospital, so thank you to every one who sent them. Last week Ryan got lots of books from Kev/Ken and he loves them, they cheered him up a lot as it has been tough for him too. We know that now Ryan is 16 he won’t receive sibling post, but we appreciate all the post and thoughts and love he’s received over the years. It’s helped a lot as it’s tough being a sibling of an unwell child, so thank you all for your continued support. Lilly has two unopened envelopes at home that arrived today but I thought I’d update now while we’re on the bus home from Brownies (her new love!) and say thank you. Lilly is in hospital with a serious blood infection, possible ITP, meningococcal infection, and other complications due to her overall conditions. She’s being so brave but is a poorly and bored girl. Lilly has been admitted to hospital due to her Epilepsy and vomiting. Hi everyone, we’ve just moved house again… but for the last time now! The move was hard on Lilly due to her autism and learning difficulties and was hard on me as I have fibromyalgia, but thankfully we’re settled now. Thank you for the books Lilly and Ryan were sent and for the few postcards they’ve both received this month. They brightened their days, as they always do when they receive them. Lilly especially loved the fairy one and Ryan loved the zombie one. Lilly also love her 1D bag she received. Thank you all, as always, for the support and love and thoughts. Lilly has received some postcards, letters, some cookie cutters and a Minnie Mouse notebook this month. Thank you very much, she loved them all. Lilly recently had a bad fall and had a serious head injury and these came the week after so they really cheered her up. She’s got quite a few appointments coming up regarding her deteriorating vision and epilepsy so the support she receives is very appreciated. Thank you. Thank you to everyone who spoilt Lilly and Ryan at Christmas. Your letters, cards, thoughts and gifts mean so very much, even to Ryan who acts so tough. With all Lilly has had going on and then with me recently being diagnosed with my own serious health condition, it means I need to rely on him a lot. He also has his exams coming up and with a recent relocation to a new area/school it’s so lovely that people are there for both my children to keep them smiling. So from me and them it is a massive thank you to all of you. To Bev, Lilly and us loved the nativity gifts (how thoughtful). We’ve quite a bit going on with Lilly at present, her vision is deteriorating fast and we don’t know why. Her heart murmur is concerning doctors and her epilepsy has evolved so she has lots of appointments, tests etc, going on at present. Things are a little hectic so sorry for the delay in thanking you all for the constant support and love over Christmas and I hope you all have a happy New Year. Sorry for the delay with thanks to everyone but I’ve recently been diagnosed with fibromyalgia and have been quite unwell, on top of a few health issues for Lilly. However, I must say thank you so very much for the birthday cards and stickers and a keyring Lilly received for her birthday this year, she loved them. Thanks also to Karen for the Halloween goody bag and to those who have sent Ryan’s few letters, they always make them smile. Thank you so much. Over the next few months we’ve numerous tests coming up including brain stem tests etc as Lilly’s vision is deteriorating and so is her mobility. We’re hoping to have some answers soon. We had thought it was all linked to her epilepsy but mri tests have revealed whatever is going on isn’t linked to her epilepsy. She has also started to lose her hair, we think it may be due to adrenal/thyroid problems linked to her syndrome, but are awaiting seeing her consultant for more ideas. Thankfully, at present, there are no obvious patches as this will devastate Lilly because she loves her ‘rapunzel’ hair. We had a big surprise this week in the form of a video message from Louis from One Direction and it has brought a smile to her face which was much needed, as she has been unwell the last month with numerous infections due to her poor immune system. Thank you all so much for the support and love for Lilly and her amazing big brother this last few months. It’s been a tough few months here as we’ve discovered Lilly is loosing her eyesight and faster than we ever thought and her mobility is decreasing and we don’t know why, so due to this she’s to endure even more tests! Her food allergies are growing which is scary and we’re struggling with her not wanting to eat at present which has been on going over a year and her weight Is becoming a concern. When she was a baby she had a feeding tube and we worked so hard to have it removed so we really hope we can sort something soon before it becomes a reality again! There’s also talk over other tests regarding her thyroid as there appears to be issues there. All this on top of all her other ailments and conditions, plus her epilepsy has made her very ill and she’s been bed bound now since the weekend and is quite poorly with a very fast heart rate, low saturation levels and high temperature. Due to her low immune system though we’re hoping we can ride it out at home. She’s been super brave and still trying to smile and through it all her big brother Ryan has been amazing. We’ve recently lost the majority of our family due to them being unable to cope with the demands Lilly’s health places on us all and also on family gatherings, so if me and their dad are busy with Lilly he occupies himself and helps around the home and if we’re ill as we’ve ailments too, he helps so much. He never moans even though behind the scenes he has issues in his health with asthma and joint problems, but he is so giving. It’s his birthday on Saturday so we’re praying Lilly is feeling better and not in hospital so he can have a lovely day for him for a change. Life is very challenging and difficult for our family as we don’t have much ‘us’ time, fun, trips, holidays etc. Things are hard but we wouldn’t change our kids at all. The sacrifices we’ve had to make are worth it and we’re totally blown away daily by their smiles, bravery and love. They are just amazing.